This is one fearless fowl that you don’t want to cross. 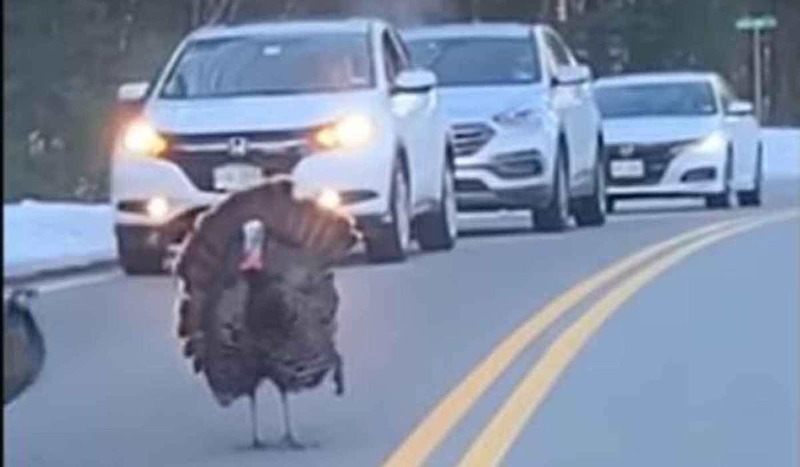 In an amusing video that was shot in Litchfield, New Hampshire last week, a brazen turkey can be seen acting as a crossing guard in the middle of a two-lane road so it can stop traffic for a dozen of its feathered friends. After an entire minute of standing defiantly between the two lanes of traffic, the turkey then follows his bird brethren into the woods. The video was captured by Donald Pomerleau as he was sitting in his car, and it has since become a viral sensation. Turkey’s are not stupid. I imagine when compared to the rest of their feathered friends they are probably in the top third when it comes to brains. They are also really MEAN.